I don’t know if anybody’s noticed, but Twitter’s about to turn six. Facebook’s eight, if you count the time it was open only to students. But as a place everybody could go, it’s also about six. And in those six years, it’s quite possible that more uninformed nonsense has been written — with greatest of authority and confidence — than in the previous 60. There are lots of reasons for it, but one of the biggest is that there was no defined body of knowledge to start with. We’ve been making this up as we go along. So any idiot could declare himself a social media expert, and plenty of imbeciles did. A major problem the experts share (I don’t pretend to be one, by the way) is a lack of balance. They suffer from what I call the Hammer Syndrome (when you have a new hammer, everything looks like a nail). Eyes get wide and the experts go all utopian on us, presenting Facebook and Twitter as the answer to every marketing question. 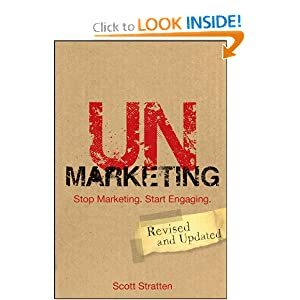 That’s why I’ve been enjoying the rare perspective of Scott Stratten in his book, Unmarketing. Let me point out that except for less than 280 characters of Twitter exchange, Scott and I don’t know each other. I bought the book the old fashioned way, from Amazon. All I’m getting out of this little plug is the pleasure of maybe helping you do a better job of connecting with your customers, prospects or first grade chums. With that out of the way, I’m free to say that Stratten’s a pretty smart guy who understands that life is bigger than Twitter. Bigger even than Facebook. Best I can tell, he actually lives in the real world. Whether online or in person, we had conversations. Scott’s word for it is engagement, and it’s as good as any. I like it because it reminds us that Facebook and Twitter aren’t just places to dump a stream of our blather out into the world in hopes that somebody will see it and come rushing to buy from us or our clients. Social media is just one way we engage. Others include the ones we’ve known and ignored all along — great service, listening, and finding ways to help other people get what they need. This is good, balanced, common-sense stuff. Communications basics, combined with the very best advice I’ve seen on how to use social media effectively. Buy it. Read it. Find the balance.